The benefits of keeping your air ducts clean are many, for not only does it help you in breathing cleaner and fresher air, it keeps major respiratory health problems at bay, saves energy consumption and also helps in prolonging the life of your HVAC system. Over the last few years there has been an alarming increase in the number of people suffering from respiratory illnesses each year; this is a cause of major concern as it can hamper the way we lead our lives in a major way. By getting your HVAC system cleaned, you can help in preventing such diseases from taking over control of your house. Our team of skilled professional cleaners at Cleaning and Restoration Inc. can help you with your duct cleaning requirements as we can help you in the removal and sanitization of each cover and also in agitating your air ducts with the help of our cleaning unit that employs the usage of Roto-Brush technique. 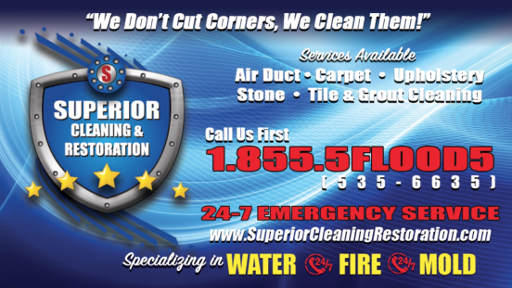 We will vacuum your entire HVAC system in no time with the help of our industry-leading truck mounted cleaning system. The ideal breeding environment for bacteria, fungi, mold and mildew to fester is the damp and dark corners of your Air Conditioning ducts. Since the ducts are responsible for the cooling and heating of the house, these allergens can easily spread through the entire house and cause respiratory diseases. With the filter of the air ducts dirty, the clean fresh air of the outdoors cannot circulate through the interiors. Allergens like pollen and mildew can freely roam inside the house which may spread disease. By cleaning the ducts you do not eradicate the chances of respiratory diseases completely however you do take a major step in combating the issue. Not only are you ensuring prevention and treatment you also prolonging the life of your HVAC system. Entrust Superior Cleaning and Restoration Inc. with all of your cleaning issues and we shall make sure that your house remains disease free.